** WATTYS 2018 WINNER ** Big Tech meets Die Hard in this techno-thriller Kirkus Reviews calls "a clever, spirited tale with a brainy, nimble heroine at the helm." From IndieReader's 5-star (highest rating) review: "Bond weaves an entertaining tale filled with deceit, robots, Russians, and tech entrepreneurs that all combine to give the reader a reason to flip pages furiously to find out what might happen next." Deb Bollinger has no time for corporate training. Her company's top engineer at just twenty-seven, Deb has blocked off her day for the one project she truly cares about: the launch of Carebnb, an app that finds spare beds for the homeless. When she's told all employees must drop everything for some busywork exercise called Blackquest 40, it's an easy no. Trouble is, her bosses aren't really asking. Blackquest 40 is the mother of all corporate trainings. A near-impossible project to be completed in forty straight hours. No phones. No internet. Sleeping on cots. Nobody in, nobody out. Deb finds the whole setup creepy and authoritarian. When a Carebnb issue necessitates her leaving the office, she heads for the door. What's the worst that could happen? 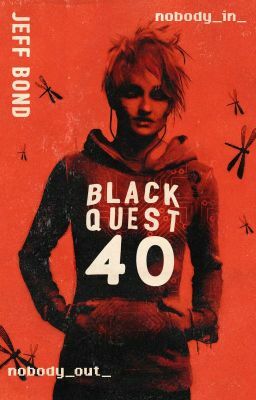 Armed commandos, HVAC-duct chases, a catastrophic master plan that gets darker by the hour - Blackquest 40 is a fresh take on the Die Hard formula, layering smart-drones and a modern heroine onto the classic action tale. Cover design and illustration by Ethan Scott.